In a major advancement in medicine, an international team of scientists has successfully created nanorobots that shrink tumors by cutting off their blood supply. Years spent developing nanobots are finally bearing fruit, thanks to progress made by researchers at Arizona State University (ASU) in collaboration with scientists from the National Center for Nanoscience and Technology (NCNST), an arm of the Chinese Academy of Sciences. The researchers successfully demonstrated the cancer-seeking nanorobots in a first-of-its-kind study that tested the technology in mammals on lung, breast, melanoma, and ovarian cancer. The team published their results in the journal Nature Biotechnology. Back in 2007, Google futurist Ray Kurzweil said that within decades, we would have nanobots, swimming through our veins keeping us healthy. Kurzweil predicted that tiny robots – often referred to as nanodocs -will keep us healthy by zapping cancer, correcting DNA damage, and removing toxins. The futurist stated that back in 2007, and his prophecy is becoming a reality in the treatment of tumors. For example, last year, a Montreal doctor announced he was planning a clinical trial of bacteriobots – the bacteria-based nanorobots that attack cancer. Nanomedicine is an emerging field that aims to use nanotechnology in medical treatments, such as making molecule-sized nanoparticles to diagnose and treat diseases, especially cancer. One goal of the field is to create nanorobots that actively seek and destroy tumors, while not harming healthy tissue. The team of scientists overcame this problem by using a simple strategy to find and starve out a tumor selectively. Conventional cancer drugs kill tumors but also injure healthy tissue throughout the body. Nanorobots overcome this limitation by delivering higher doses of cancer-killing medicine at the precise location of the tumor. 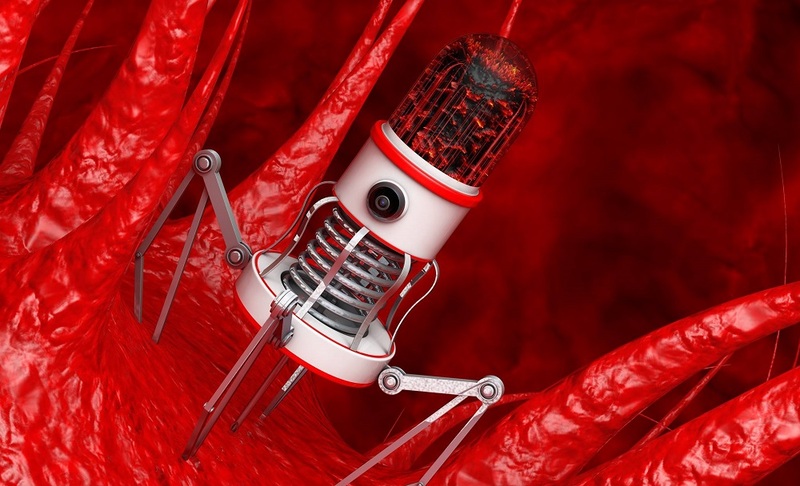 Moreover, nanorobots have the advantage of being small and able to penetrate tumors. The international team started working on this approach about five years ago. The NCNST scientists first wanted to cut-off the tumor’s blood supply using unintelligent DNA-based nanocarriers. Professor Yan had a better idea and upgraded the design to a fully programmable system, able to perform its mission entirely on its own. Each nanorobot is constructed from a flat, rectangular DNA origami sheet, 90nm by 60nm in size. The cancer-killing payload is a blood-clotting enzyme called thrombin, which is attached to the surface of the nanorobot. Thrombin blocks blood flow by clotting the blood feeding a tumor, starving it to death. “These nanorobots can be programmed to transport molecular payloads and cause on-site tumor blood supply blockages, which can lead to tissue death and shrink the tumor,” said Baoquan Ding, a professor at NCNST. To perform their study, the researchers used a well-known mouse tumor model, injecting human cancer cells into a mouse to induce aggressive tumor growth. Once the tumor was growing, the team set the tiny robots loose, injecting the nanorobots into mice, which traveled through the bloodstream, homing in on the tumors. The key to programming the nanorobot to only attacks tumor cells was to include a particular molecule on its surface, called a DNA aptamer. The DNA aptamer explicitly targets the protein nucleolin. The protein is not found on the surface of healthy cells, however, occurs in abundance on the surface of tumor endothelial cells. Once bound to the tumor blood vessel surface, the nanorobot was programmed, like a Trojan horse, to deliver its deadly thrombin payload to the heart of the tumor. The nanorobots worked quickly and surrounded the tumor a few short hours after injection. More importantly, the team did not find evidence of the nanorobots spreading into the brain where it could cause adverse effects, such as a stroke. “The nanorobots are decidedly safe in the normal tissues of mice and large animals,” says Guangjun Nie, a professor at NCNST and a key member of the team. The researchers reported that the nanorobot treatment blocked the blood supply of the cancer mass and caused damage to tumor tissues within 24 hours. Most importantly, the team says, it did not affect healthy tissues. After attacking the tumors, most of the cancer-seeking nanorobots cleared the body after 24 hours. After three days, the team observed large clots in all of the blood vessels of the tumor. The researchers say the trick is to trigger the release of thrombin only when it is inside the blood vessels of the tumor. Moreover, in the mice with melanoma, 3 out of 8 test mice receiving the nanorobot treatment showed complete regression of the tumors. Their median survival time more than doubled, increasing from 20.5 to 45 days. The team also tested the cancer-seeking nanorobots on a mouse lung cancer model, which mimics the disease in humans. The nanorobots shrank their tumor tissues after a 2-week course of treatment. Help us spread the word – Share this article on social media. It only takes one click on any of the links on this page. Suping Li et al. “A DNA nanorobot functions as a cancer therapeutic in response to a molecular trigger in vivo.” Nature Biotechnology. doi:10.1038/nbt.4071. 12 February 2018. Link to article in Nature. Arizona State University. “Cancer-fighting nanorobots programmed to seek and destroy tumors.” February 12, 2018. Link to the press release. Diagnosis, Treatment, and Advice: This article is intended for informational and educational purposes only and is not a substitute for qualified, professional medical advice. The opinions and information stated in this article should not be used during any medical emergency or for the diagnosis or treatment of any medical condition. Consult a qualified and licensed physician for the diagnosis and treatment of any and all medical conditions. Experimental cancer treatments carry a much higher risk than FDA-approved ones. Dial 9-1-1, or an equivalent emergency hotline number, for all medical emergencies. As well, consult a licensed, qualified physician before changing your diet, supplement or exercise programs.